Two kombucha brewers talk about family, true grit, and how to start a company. They said to meet them at the French Broad Chocolate Lounge...which, to me, seemed like an odd choice, given what I wanted to talk to them about. I would have expected the local co-op grocery, or at least a coffee shop with crunchy predilections. "Ooh, you're meeting the Buchi Mamas?" The Tiffany blue walls and polished tables are making me nervous; I wonder if I should have worn a nicer pair of shoes. But what worries me more is the number of patrons at this hour of the day. I'm loath to share their attention with others…and not just for the sake of my interview. The truth is that I'm here for some much-needed moral support. I know…and I know you all know…that I love kombucha in a way that defies all sense or seemly behavior. I love it enough to spend more on a single bottle than on a meal. Enough to seek it out, even when it takes me miles off my planned route. Enough to carry a gallon-size glass tank around the country with me, so I can always brew my own. I don't think I love kombucha more than some people love, say, cable TV programming, or Apple computer products. Certainly, it's a less common love than either of those things. I don't mind being labeled "weird" or even "addict," because of it. But you know how it is with idiosyncrasies--sometimes you want to connect because of them, not in spite of them. I just want to talk to somebody who gets what I get about kombucha--somebody to whom it means something more than just a drink or a health fad or a way to make money. I want to talk about kombucha with transparent excitement, without having to roll my eyes at myself so the other person doesn't get weirded out. If anyone's going to understand this about me, I feel sure it's going to be the Buchi Mamas. My first encounter with Buchi was just after Thanksgiving last year, at the Mt. Pleasant Whole Foods near my aunt and uncle's place in South Carolina. Like a homing pigeon, I was drawn to a brown bottle with a label I'd never seen before. On the back was a cameo-sized photograph showing two long-haired women sitting in a garden of wildflowers. The photo, combined with the thumbnail-sketch story of Buchi's origins as the first woman-owned commercial brewery in the southeast, was peculiarly heartwarming. It was folksy, inspiring, and warmly authentic all at once, like meeting a movie star in a yarn shop. I felt as if I'd been reached out to--as though somebody I didn't know wanted to know me. The actual drink was a different story; to be honest, I didn't know if I liked it. I was used to drinking kombucha with a single, identifiable flavor; this one combined cayenne and ginger with apple and beet juices in a way that leaned heavier on the medicinal side than any kombucha I'd ever tasted (except the kind my mom makes, which tastes like paint thinner). The mixture of spicy and sour together had none of the comfort of familiarity. Noob that I was, I thought maybe I should have stuck with the big brand. "You have Buchi!" I said to the guy taking my order. "Yeah," he smiled, "we have it in bottles and on tap." A five-minute conversation and two taste-tests later, not only had we learned each other's names and jobs and history of life in Franklin, but I'd found my connection. From then on, Buchi has always been my kombucha whenever I'm in the southeast. Maybe it's stupid. But stupid things like that make all the difference to transients like me. We all need an anchor to connect us with others--if it's not the street we live on or where we come from, then it has to be things like the friends we have, and the drinks we order. Six months later, I found myself back in Franklin, and once again standing in front of Josh the barista/musician. "Chelsea," he said, pointing at me. "The Buchi drinker." I confess to expecting a couple of hefty, hairy mountain women, clothed perhaps in the tie-dye and crewelwork that you see hanging in every other boutique window on Lexington Avenue. But there's no doubt it's them. They both wear belted, flared jeans with knives in leather holsters at their hips. They both have untamed manes of curly hair (Jeannine's blonde, Sarah's auburn) and pellucid blue-grey eyes (Jeannine's soft, Sarah's feisty). They walk with a visceral attachment to each other, like Butch Cassidy and the Sundance Kid entering a saloon, absorbing the immediate attention turned upon them with nonchalant grace. They speak the way they move--with stately, resonant ease--often repeating each other's words or speaking simultaneously. When I finish explaining how I make kombucha on the road, they both nod. And when I tell them that their personality-infused brand (as opposed to a "brand personality") was what attracted me, they murmur in affirmation. They know; they hear it all the time; it's exactly what they were going for. At that moment, we're interrupted by another graceful, beautiful woman, who trills like a woodland bird in delight. She loves them, she misses them, they've got to get together soon. I venture a guess that this happens to them a lot--getting stopped by friends and fans in the course of their day. They answer simultaneously, drawing hesitantly on a high-pitched syllable, assuring me that their answer is a modest lie. Of the two Buchi Mamas, Jeannine is the more deliberate. (She vetted my site before they came.) Her precise diction evinces her background in early education, as she recounts the immediate effect of kombucha of clearing up her psoriasis, three years ago. She learned about it from Sally Fallon's Nourishing Traditions, a cookbook that advocates radical reversal of modern food production for the improvement of physical and psychological health. She wasn't sure which of the book's protocols--raw milk, soaked grains, fermented foods, or the total package--had effected her healing, until the early days of Buchi, when their demanding production schedule left the two of them with almost no kombucha for themselves. "I always say as crazy as our schedules are, as much stress as we're under, if we weren't drinking kombucha, we we'd be in a lot worse shape." "Think if we were making cookies. Or even beer." At that time, Jeannine's family was living in Denton, a suburb of Dallas whose culture was proving less and less compatible with their values. Attracted toward the east coast for its diversity of both plant life and progressive culture, and drawn to the possibility of living in an intentional community, they consulted "the book" for a place where they could join with other families who shared their ideals. "We were living in suburbia, thinking there's gotta be a better way to live, and we're going to find it." They came to North Carolina in 2007 to explore Earthaven, an ecovillage on the outskirts of Asheville. While they ultimately decided against joining the community, their visit brought them in contact with Clarke Snell, author of what might be the only how-to guide for green building. He found Jeannine's husband a job, and they moved to Asheville. They fell in love with it right away, Jeannine says--the friendly, outdoorsy people, farmers' markets every day of the week, and a community that loved sharing her homemade kombucha. "Back in Texas, I'd try to share it with friends and they'd be like 'What? It's alive? It's got things in it?'" "The more I'd share it, people would say 'Wow, this is way better than what's at the store.'" That's what drew Jeannine's attention to the one gaping omission within Asheville's local markets. It seemed crazy to her that, with all the health-conscious and environmentally conscientious people in Asheville, the only available kombucha would be imported all the way from California. She began making calls to find out what she had to do, legally speaking, to sell a little of her excess kombucha at the farmers market. On the first day of school in 2008, Sarah introduced herself to Jeannine: "I hear you make kombucha." One of the teachers from their homeschool co-op had told each of them about the other, after being offered kombucha at both their homes. Sarah had also learned about kombucha through Nourishing Traditions, which she'd been cooking from since the birth of her first child. "I was brewing a lot of mead, having fun with that, and my daughter wanted something to drink, too." Unlike Jeannine, Sarah speaks, with longer and rounder vowels, at a lazy pace that belies her impulsive energy. "I was looking for a path, to build just a little business--just something to do with another mom. What could I do that would be enjoyable, bring in a little extra income, but more just about having the kids and doing it together? I had been sewing a lot--that was an idea--but when Jeannine said, 'I'm going to get my kitchen certified,' I said, 'Why not do it together? It'll be way more fun.' I'm very spontaneous." That, she concedes wryly, was the fastest moment in the process. While spontaneity is germane to making fermented foods, it doesn't mix so well with selling them. "We didn't know what we were signing onto," Sarah admits. "It's not like we decided to start a big branded company. All we decided to do was make a little extra kombucha in Jeannine's kitchen. Five gallons a week instead of one. Barely enough for a farmers' market." "On every surface--stacked up on the bookshelves, on the mantel..."
They admit to never planning the level of growth Buchi has achieved. At the same time, it wasn't exactly a surprise, either. When requests from places as far away as Colorado, it's not their own aspirations, fears or even capabilities that they consult. Instead, they talk about the product in its own right, the way a parent might talk about their child. "We're like, 'Well, if Buchi--this beverage, this brand--wants to be national, why limit it?'" Sarah says. "We're open to not limiting it, but we're not driving every day, going 'We've gotta be national!' That's not our approach at all. It's being pulled. By people." "We think the role of kombucha is much bigger than 'Let's put this in a bottle and sell it," he tells me. "We've realized kombucha is the conduit to a sustainable community." He refers me to a TED talk he recently saw, which explains the proliferation of bacteria as a microcosm of how human life flourishes. "We have this idea that were singular entities, but we're really bacteria, something far more ancient," he explains. "What we really need if we're going to survive as a species is a living community where people being elements together for healing." Buchi, as a drink and as a company, connects its associates not only to each other, but to a lot of things they care about--such as a nonprofit school in Asheville, for families where parents want to work and raise their kids with equal integrity. This is a particular source of satisfaction for Jeannine, who spent her education training days dreaming of opening her own school. "I didn't realize it was going to come through making kombucha!" There's a note of triumph in her laugh. They also look forward to the opportunity to help incubate other small businesses, through mentorship and financial support. "There's many other people with Buchi that have grand visions," says Sarah. "We all have different ideas of how we would want to plug in, outside of Buchi. "It all comes down to how to make this world better. We see Buchi as the springboard to help do a lot of other things." Last fall, with the reputation of Buchi spreading beyond its region, an investor showed up to help them expand the company. "We knew that we were going to need funding to get to the next level. We were making all our decisions, planning our growth based on having his funds and expertise come in. We were growing faster than our cash flow would allow us to grow." On the promise of a million-dollar investment, they committed to production for a much larger network of retailers. But when the moment came for the money to come through, he suddenly pulled back, said he wanted more control of the company in exchange for his investment. "He had obviously seen our books, seen that we were in a cash crunch. It's almost like…"
"That was really horribly hard and traumatizing for the company. We found ourselves going 'This is going into the ground! What are we going to do? All these people are depending on us.'" Sarah describes how much fell on Jeannine's shoulders--she stayed at their brewing base, taking over management of the brewery in the absence of their office manager, who ended up leaving in the cash crunch that followed their break with the investor. Sarah went out on the road with Mike, their marketing guy, to rep the brand. "We just sucked it up and worked even harder. It was like divide and conquer. 'Here, you're better at that, you do that. You're better at that, you focus on that.'" "And we turned it around," Sarah says. "We never had to pay those guys late. We didn't get paid..."
"We had to call in whatever savings and debts we had to survive for the next..."
She counts off on her fingers. "..four or five months. The shining moment was how we handled pulling ourselves up byt the bootstraps and getting past that. We turned it around. We increased sales, we really increased our efficiency, we learned a lot." When she says "we," she's talking about the entire Buchi staff. All the employees who stayed on took extra roles to fill for those who had left. Office admins started doing brewery work. People offered to work for the month and be paid later. "To have people say that was pretty amazing." And that solidarity was what got them through it, Sarah says--knowing how may people were depending on Buchi's success. "Beyond our families--everyone who works with us, everyone who loves it and drinks it, and is part of the Buchi tribe. Thousands of people are depending on it not just disappearing. When people know the story of how we started it--how we had no experience, and created it this far--it's an inspiration to people." "People tend to think that other people have a better chance of succeeding, sometimes." "It's true grit," Sarah says meditatively. "We put too much into this to let it go," Jeannine agrees. There's always that moment within a detox program where you wonder if it's worth it. If the healing, as you'll experience it, will offset the grinding headaches and the swampy stomach pain that comes before. I felt this way when I first started taking BioKult probiotics; I know other people have experienced it with cleanses, with taking sole, and even with drinking kombucha. The question can be just as hard to answer afterwards, as it is in the moment. "I don't know if that would be the phrase that would come out, but there are definitely moments where like 'Oh my god, what did we get ourselves into?' We definitely had no idea what we were getting ourselves into." You do ask yourself, she says, what am I giving up, and where is it going? "But for me, it's like a split second. There's never a day where I'm like, 'I don't think this is worth it.'" Her vibrant red curls give a gentle but emphatic shake. "At all. I've never said that. It's just..."
"How are we going to keep doing this?" For a moment, their gazes drift into the rafters, and they heave a mutual sigh, their chests rising and falling in unison. They catch themselves in it, and immediately break into a laugh. Sighs like this are something they're known for; their office manager can always tell what level of exhaustion they're reached by the synchronicity of their sighs. "A big part of it is, we're not business people," says Jeannine. "We don't think that way--it's not us." "Type A, like," says Sarah. "It's a new world for us," Jeannine adds. "And we're just figuring it out. It's been a crash course since we got started." "And we've always been growing," Jeannine concludes. "It's never been static, maintenance level." What keeps them from self-doubt, in these moments of exhaustion, are the people who work with them. They both agree on this without hesitation. Jeannine recalls the first time Zane, their graphic designer showed them his idea for their brand. It was a moment that kickstarted them way past where they expected to be, at that moment; their little idea suddenly looked like it could carry its own life. "He embodied a lot of…"
"The potential! We resonated with it immediately. We had the idea, the kombucha…but the packaging is so important to communicate to people, when you're not there, what you're about." The brand personality is important not just for marketing's sake...the brand is meant to communicate what they themselves would say, if they could put a bottle into a person's hand. They want Buchi to communicate something deeper than just a beverage, deeper even than health or progress or enlightenment. Those things are all part of it, of course, but what really comes across with the Buchi bottle, as opposed to other bottlers, is that by buying one, you're making a friend. This is largely due to the photograph of the two of them on the label--which, Jeannine says, they were warned not to do. "That was a big decision, to put our pictures on there," says Jeannine. "We were highly recommended by some business people 'You don't want your face, or your person, associated with your business.'" This advice was baffling to her. "We want to make something that's great, and we want to stand behind it. In our minds, it shows authenticity--backing up what you're doing. Why would we not want that?" "Look at all those brands on the shelf in Whole Foods--do you know the people behind those companies? So if that 'company' does something shady, it's just this LLC, this wall, smoke and mirrors. When it goes deeper into people, then there's that connection, the accountability, that makes people stand behind what they're doing--literally stand right next to it, instead of hiding behind it. For us, it just felt really natural. "This is our family. We started making it for our family, and you're our family, too. I think that's one of the biggest thing that speaks to you--we're a community of people, creating this beverage and sharing it with our greater community of people, and they're sharing it with their greater community. "That's how we've grown the company, as well. It's been really grassroots--out at events, working endlessly to connect directly with people. Whereas other bigger companies, they have a huge marketing budget, so they spend money, they sponsor some yogi, they buy their cool factor." "It's one-dimensional. And we're not." As of now, the company employs 13 people--7 full time, 5 part-time. They brew in vessels that vary in quantities of hundred gallons. Brewing at that scale, Sarah says, is "kind of like getting ten cats to go in the same direction." And yes, they laugh, the scoby is gigantic. "If we're going to continue, we have to buy this." They could have changed the model, of course, but they wanted people to be able to buy it for their kids. Of course, to veteran brewers and drinkers, the new rule is annoying; they laugh guiltily about that. That's the plight of a home brewer…you start developing a taste for the funk. Their kids love to eat scoby…they ask for it all the time. (Sarah says they think it's like gum; those are the kind of children I dream of having.) And their friends always come into the house asking if there's any Buchi for them to drink. "It's like asking me which kid is my favorite. Neither of them are my favorite--I love different qualities in each. I rotate all over the place, depending on the season." Flavor development is a company-wide endeavor--or, as Sarah calls it, "An amazing tribe evolution." "It's very conversational," Jeannine agrees. "That's how I've always made decisions--I never have the answer very quickly. I figure out by bouncing ideas off of people." Sarah continues that the open collaboration that they cultivate is the key to Buchi's success--if they weren't there, the company would still be producing amazing kombucha. But then--she thinks about it--maybe not. "We're kind of the glue," she decides. "We're the moms. You've got to have the mama to hold the family tribe together." At the question of how the two of them hold together--whether they consistently find themselves on the same page with everything--they look at each other, as if on cue, and crack up. "We get on pretty well," Sarah concedes. "It's the only reason the company's still together, is that we're able to go through hardship and keep going past it." What makes it work, Jeannine says, is their mutual easy-going natures, and willingness to see each other's point of view. Sarah agrees that neither of them have a need to run the whole show. "The person that's seriously driven, wants to control the outcome, run the show, direct everybody--neither of us are like that. Together, we become a unit that's…still not like that! Which I think is what allows us to draw in amazing people. We want to hear them. We want them to put amazing input into it." Learn all about Buchi, including new flavors and new places to find it. Read more about the secret behind the Buchi brand. 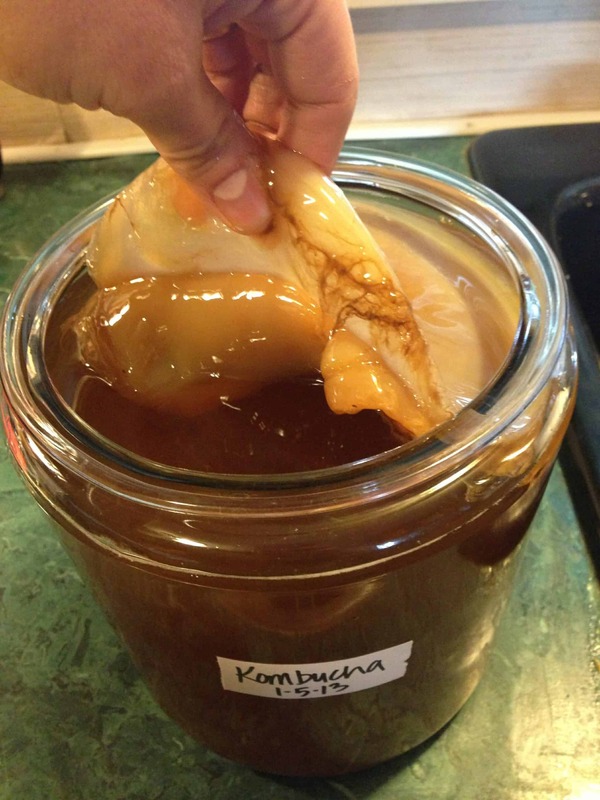 Learn how to make your own kombucha.